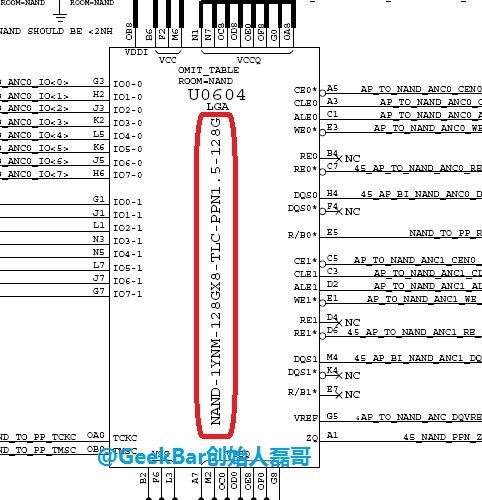 Leaked schematics from phone repair company GeekBar (via G 4 Games) suggest Apple may be preparing to release a 128 GB iPhone 6 model. An accompanying part supply list contains entries for NAND flash modules from Toshiba and Hynix in capacities of 16 GB, 64 GB and 128 GB. The 32 GB storage option is notably absent from the list, although the reason for its exclusion is unknown. Previous rumors have suggested Apple has been working on a 128 GB iPhone model, with one rumor claiming the higher capacity module would debut in the 5.5-inch model only. The same leak also predicted Apple would drop the 16 GB option, introducing a 4.7-inch iPhone 6 model with two storage options (32 and 64 GB) and a 5.5-inch model with three storage capacities (32, 64 and 128 GB). This new parts list from GeekBar appears to refute that claim, opening the door for Apple to add the 128 GB model as a fourth storage option for consumers. Apple launched its first 128 GB iOS device in early 2013 with a mid-cycle upgrade to the fourth-generation iPad. The option expanded across the iPad lineup with the October 2013 introduction of the iPad Air and iPad mini with Retina display, which also are available in 16 GB, 32 GB and 64 GB capacities. The 128 GB option has, however, yet to make its way into the smaller iPhone and iPod touch form factors. Dumb move. This phone will be a total flop if the top storage offering isnt 129GB. Awesome, I hope it drops the price of the 64gb version, since that's what I need. And I do hope they drop the 16gb. Prepare your bank accounts. I think this might be the first one getting into the 4 digit range. What is with people and wireless charging? It's so gimmicky. Unless I can charge my phone while still moving about a room with my phone in my pocket, I couldn't care less. A lot of people will be happy if this is indeed true. I'm ok with my 64gb,but happy for those that want this,if indeed this is true. i hope it is available in the 4.7" and is not just for the 5.5"
would make a lot of sense. 100$ for the first additional 48GB, 100$ for the next 64GB. I agree completely. I clicked here to say this exactly. I also think it's to drive up that initial $100 price jump. 16GB just isn't enough, but the margin is SO much higher on the 2nd tier, so Apple wants to encourage that even more.